Collage by NASA Astronaut and AFSer Cady Coleman. Courtesy of the Archives of the American Field Service and AFS Intercultural Programs. Since the beginning, AFS has been a risk-taking organization that transcends borders, but did you know AFS has even transcended the boundaries of Earth on more than one occasion? This month, following the solar eclipse that was visible to the United States, northern Canada, northern South America, northwestern Europe and Africa, and the Chukchi Peninsula in Asia in late August, the staff of the AFS Archives would like to highlight a few of AFS’s connections to space. On March 1, 1986, the AFS Houston Weekend Ceremonies were held at the NASA Johnson Space Center to honor AFSer Major Brian O’Connor. 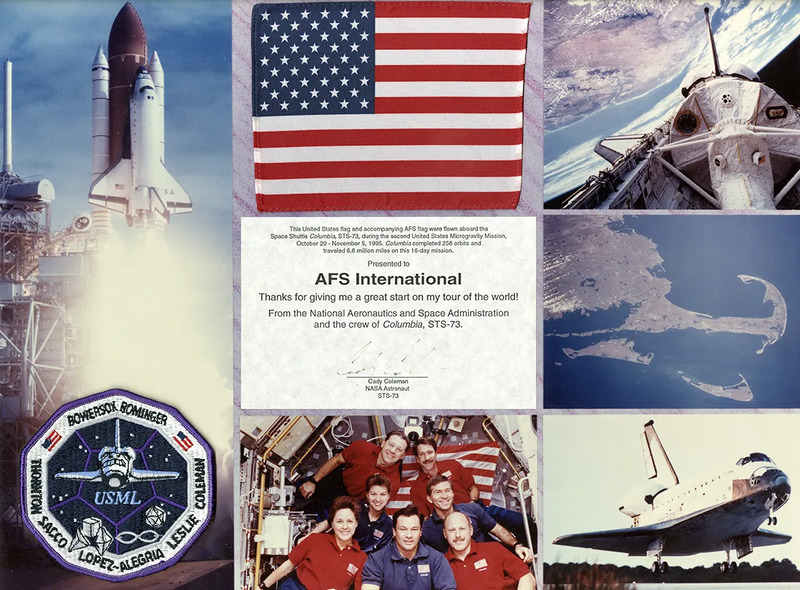 O’Connor was pilot of the shuttle Atlantis in November 1985, and proudly carried the AFS flag into space. With Southeast Texas Area AFS students and their host families in attendance, the flag from the Atlantis mission was given to AFS.